The Carrie B is named for the original owner’s mother who lived to be 99. 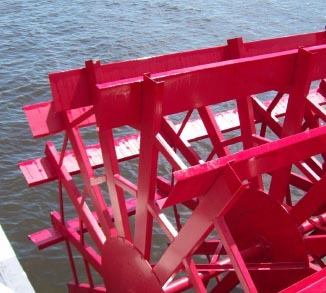 The Carrie B is an authentic replica of a 19th century paddlewheeler and private charter company operating throughout Hampton Roads, VA. 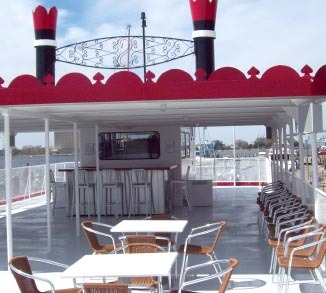 The Carrie B has two decks—the lower deck is enclosed and climate controlled and measures 2,000 sq. ft. The upper deck is an open air space of 2,300 sq. ft. and is partially canopied. The Carrie B is operated by Senior Captain (2nd generation) Mark Johnson and Captain (3rd generation) Trafton Jordan. 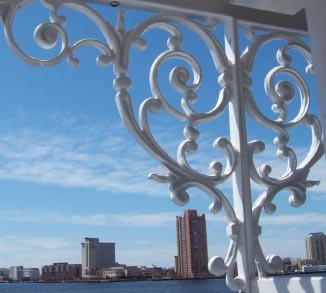 The Carrie B traverses the area’s waterways including, the Elizabeth River, the Intracoastal Waterway, the Western Branch of the Elizabeth River, the Lafayette River, the James River, the Nansemond River, Hampton Creek, and the Great Dismal Swamp. Other specific locations can be toured upon request. Carrie B Cruises accepts MasterCard, Visa, Check and Cash for payment and tipping is at the discretion of passengers. The Carrie B is handicap accessible, however, there is no elevator or lift from the Lower Deck to the Upper Deck. Weather conditions are carefully evaluated by the Captain, however, RAIN is NOT considered inclement weather. Groups organizers have the discretion to contract the catering company and florist of their choice and if not, the Carrie B staff will be happy to make recommendations, but no outside or individual food may be carried on. There is no extra charge for table and chair rentals. The Carrie B provides, as a part of your charter, high quality tables and chairs. No outside equipment is permitted. An average charter on the Carrie B is three hours, however, longer or shorter trips may be available upon request. Most passengers arrive 30 minutes prior to the Carrie B’s departure. The number of crew members operating on the Carrie B during a charter is dependent upon the number of passengers and is determined by the Captain and staff of Carrie B Cruises. Charters are often booked up to one year in advance in order to guarantee a specific date. Dates are reserved on a first come basis. Parking for the Carrie B is available at the Crowne Plaza garage (Hampton), the Waterside Garage (Norfolk), North Landing Garage (Portsmouth) and at the Great Bridge Locks Park (Chesapeake). The Carrie B assumes no responsibility for any charge or fee that may be associated with one or more of the recommended parking locations.